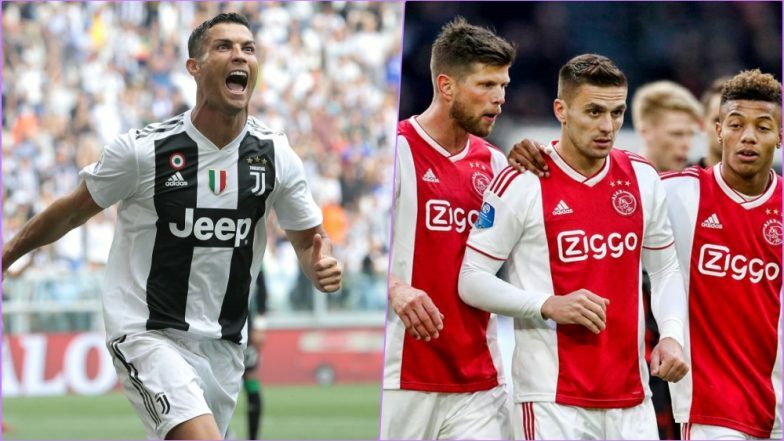 Juventus vs Ajax, Champions League Quarter-Final Live Streaming Online: How to Get UEFA CL 2018–19 Leg 2 of 2 Match Live Telecast on TV & Free Football Score Updates in Indian Time? Juventus welcome Ajax at Turin after a pulsating game in Amsterdam that saw both teams having a go at each other in the final third. With an away goal to their credit and the tie balanced 1-1, the Bianconeri are confident they can advance. Coach Massimiliano Allegri has called for the same intensity the hosts displayed against Atletico Madrid where they turned the game on its scoring three goals without reply. Ajax are a youthful setup who have exceeded expectations this year with their performance in Europe. They are bound to go with the same attacking philosophy that paid them rich dividends against Real Madrid. Juventus vs Ajax - Live Football Score Updates. Defensive linchpin Giorgio Chiellini is out of the game having failed to recover from an injury while striker Mario Mandzukic is also sidelined. Emre Can is back in the squad along with Cristiano Ronaldo and Miralem Pjanic who were both rested against SPAL. Paulo Dybala will likely partner Cristiano Ronaldo who will assume the central role tonight with Mandzukic missing. Federico Bernardeschi should get a look in given the work rate he brings to the team, and he could form a lethal partnership with Sandro on the left flank. Barcelona vs Manchester United, Champions League Quarter-Final Live Streaming Online: How to Get UEFA CL 2018–19 Leg 2 of 2 Match Live Telecast on TV & Free Football Score Updates in Indian Time? Midfielder Frenkie De Jong has travelled with the squad to Turin despite a hamstring problem suffered early in their league game against Excelsior. If he does miss out, it is a huge blow to the visitors who depend a lot on his authority in the middle of the park. Left-back Nicolas Tagliafico is suspended and will be replaced by Noussair Mazraoui. David Neres and Dusan Tadic have been the standout players of this season’s Champions League, and if they get going, Ajax will fancy themselves against Juventus. When is Juventus vs Ajax, Champions League 2018-19 Quarter-Final Leg 2 of 2 Football Match Schedule (Date, Time and Venue Details)? Juventus vs Ajax is one thriller fans will be waiting to catch on April 17 (Wednesday as per India time). The UEFA Champions League 2018-19 quarter-final leg 2 of 2 football match will be held at Juventus Stadium (Allianz Stadium) in Turin, Italy with the kick-off time being 12.30 am IST. How to Watch Live Telecast of Juventus vs Ajax, Champions League 2018-19 Quarter-Final Leg 2 of 2 Football Match? The live telecast of Juventus vs Ajax will be exclusively available on Sony Ten 1, Sony Ten 2, or Sony ESPN channels. Where to Get Free Live Streaming Online of Juventus vs Ajax, Champions League 2018-19 Quarter-Final Leg 2 of 2 Football Match? With Sony Sports Network as the official broadcaster, their digital platform Sony Liv will be providing the free video streaming. You can catch Barcelona vs Manchester United, tie of UEFA Champions League with free live streaming online on Sony Liv. Live score updates of Barcelona vs Manchester United, will be available on LatestLY here. Juventus have a brilliant defence that is master at absorbing pressure and with Cristiano Ronaldo in their ranks, they will go through.